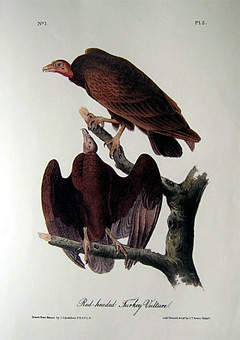 Pictured (right) is John J Audubon’s illustration of the Red-Headed Turkey Vulture, today commonly referred to as the Turkey Vulture. This hand-colored lithograph is Plate #2 from the Octavo Edition of Birds of America – created from 1840 to 1844. “This species is far from being known throughout the United States, for it has never been seen farther eastward than the confines of New Jersey. None, I believe, have been observed in New York; and on asking about it in Massachusetts and Maine, I found that, excepting those persons acquainted with our birds generally, none knew it. On my late northern journeys I nowhere saw it. A very few remain and spend the winter in New Jersey and Pennsylvania, where I have seen them only during summer, and where they breed. As we proceed farther south, they become more and more abundant. They are equally attached to maritime districts, and the vicinity of the sea-shore, where they find abundance of food. TURKEY-VULTURE or TURKEY-BUZZARD, Vultur Aura, Wils., vol.ix. p. 96. CATHARTES AURA, Bonap. Syn., p. 22. CATHARTES AURA, TURKEY-VULTURE, Rich. & Swains., F. Bor. Amer., vol. ii. p. 4. TURKEY-VULTURE or TURKEY-BUZZARD, Nuttall, Man., vol. ii. p. 43. TURKEY-BUZZARD, Cathartes Aura, Aud., vol. ii. p. 296; vol. v. p. 339. Young fully fledged. The bill is, of course, shorter and more slender, its horny tip pale blue, black on the back; the skin of the head is flesh-coloured, the iris yellowish, the feet flesh-coloured. The plumage is nearly of the same colour as in the adult.